In the heart of New Zealand’s stunning Southern Lakes region, Wanaka Luxury Apartments offer stylish self-contained full-service holiday accommodation that’s perfect for every season. 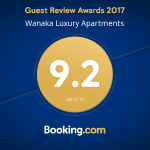 Whether you are in Wanaka for a few nights to a few months, Wanaka Luxury Apartments is the perfect place to stay for Sporting trips, Romantic getaways, Business trips and Family ski holidays. Blessed with sweeping mountain views and a short stroll to the lake, shops, and restaurants; 29 luxury apartments provide a choice of 1, 2 or 3 bedroom living, complete with heated spa, pool, BBQ and pizza oven. Traditional ski lodge features such as open fires combine with DVD players, plasma screens, wireless internet, and built-in espresso coffee machines. Mountain bikes are provided for you to explore our 'slice of heaven' & we can tailor an activities program exactly to your interests. Snow adventures can range from enjoyable to extreme, with skiing at Cardrona Alpine Resort and Treble Cone Ski Area just 35 minutes away, and heli-skiing on the pristine powder of Harris Mountains nearby. In winter, toast your toes in front of our cosy fires . . . and in summer, enjoy all this beautiful alpine environment has to offer from the comfort of our luxury apartments with super-modern design and luxurious touches. No other Lake Wanaka accommodation option combines abundant luxury, privacy, fun, and convenience with such style – enjoy! Wanaka Luxury Apartments offer stylish self-contained full service holiday accommodation that’s perfect for every season. 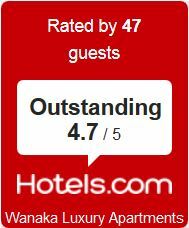 Check availability and book your next holiday. We are more than happy to help with any questions or enquiries.